One of the things I love best about my small town is that there are dirt roads in every direction. I don’t typically run on them during the week simply because I’m out and back before the sun even thinks about rising. The only caveat to this is if there’s a full moon. It’s simply amazing how bright it can be at 4 o’clock in the morning with a full moon bouncing off of the snow. I love the absolute peace of hearing my own breath, and the sounds the snow makes when it crunches under my shoes. Sometimes I have a song or tune rattling around in my head, but most of the time I’m thinking about a whole lot of nothing. It’s amazing how much I can think about nothing. There are those days where I have more on my mind that I have time to run miles. I have (too many times) let my thoughts rob me of my peace. I found this happening on my run the other day. I was so consumed with a variety of things trying to figure them all out on my run, when I decided that enough was enough. This was my time to clear my head. This was my time to push myself as much as I could. This was my time…for me. I only needed that one hour, but I needed it for me. Then, I noticed the sign “Pavement Ends”. I know I’ve seen that sign a million times on my runs, but it wasn’t until yesterday that I realized it meant something more to me. 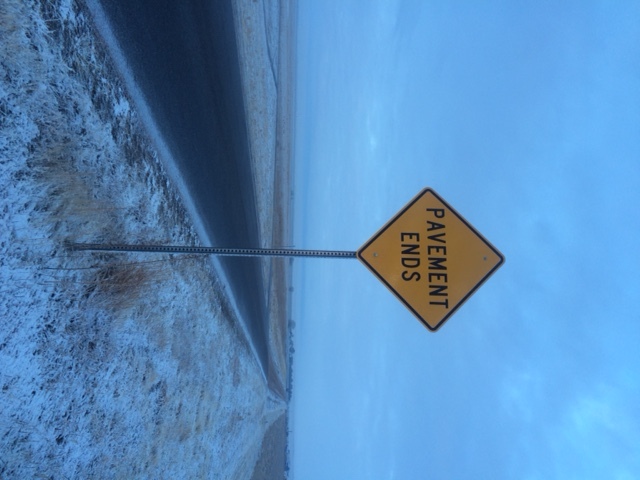 Pavement ends. Life begins. Leave it at the door. Lay it before God. Whatever you want to call it, it is what it is when it is most to you. Pavement ends where life begins. It’s time to live.